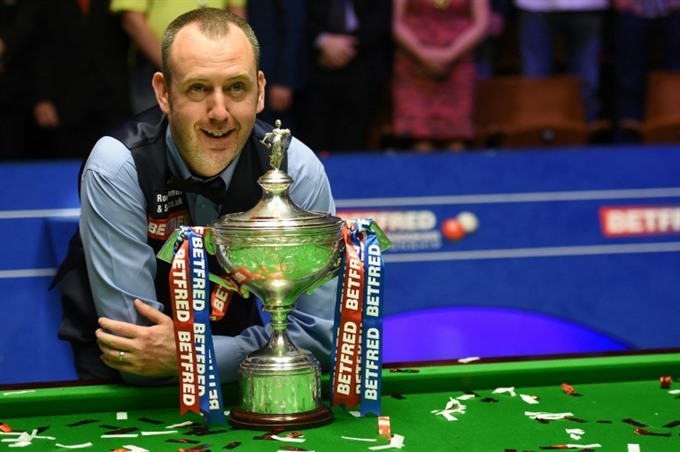 LONDON — Mark Williams fought off a stunning comeback from John Higgins to claim his third world snooker crown on Monday and become at 43 the oldest champion since Ray Reardon 40 years ago. The Welshman won a gripping final 18-16 to add to his titles in 2000 and 2003. Higgins, 42 and seeking a fifth title, fought back from a seven-frame deficit to draw level at 15-15, but Williams held on to take the sport’s showcase. It capped a remarkable late-career revival as he did not even qualify for the championships in 2017, and last reached the final 15 years ago, when he defeated Ken Doherty. "Last year I watched this in a caravan having some beers. I just can’t believe it. Last year I was seriously thinking of giving up" Williams told the BBC. He was 15-10 up, three frames away from the title, after Monday’s afternoon session having started the day 10-7 up following Sunday’s opening exchange. He stormed seven frames clear when taking Monday’s first four frames but Higgins fought back to avoid heading home early. Higgins said: "Today I was 13-7 behind and I was worried if I would take it to the fourth session, I didn’t want to lose with a session to spare. "It was a good match to watch but obviously I’m disappointed. He is a great champion." The two fortysomethings received a standing ovation at Sheffield’s Crucible Theatre as they emerged for the concluding evening session. And Higgins had the captivated crowd on the edge of their seats as he compiled a stunning 131 break after a costly error by Williams to take the 27th frame to make it 15-11. That was the Scot’s fourth century in the final. And he clawed back to within three frames when taking the next. Williams then seemingly had it for the taking, but another mistake at 58-1 saw Higgins return to the table with a clearance of 67. Snooker great Steve Davis, a six-time world champion and commentating now for the BBC, said Higgins had "thrown a hand grenade into Mark Williams’ brain" with those two quickfire frames. And so it proved as he rattled a red around the jaws of a pocket to let Higgins in with a chance at 47-0. Showing nerves of steel Higgins nicked the frame with a break of 82. A pensive Williams, biting his lip, could only sit and suffer, his lead now cut to two. Higgins steamrollered the next 91-0 to leave the final tantalisingly poised at 15-14 as the players took a 10 minute time out. After a much needed cuppa the two veteran stars of the green baize resumed hostilities, with ice-cool Higgins drawing level at 15-15. Williams finally stopped Higgins’s miraculous march to take the 31st and 32nd frames to leave ’the Welsh potting machine’ just one shy of the greatest prize in the sport. Williams was one pot away from victory but he missed a pink in the next. Higgins, 63-0 behind, yet again defied the odds to steal the frame with a clearance of 65 and get back to within one. But Williams wasn’t to be denied, sealing the championship in the next frame in what Davis called "the best final ever".